The world of Arithmetic is the world of practical maths. We see it all around: numbers, ratios, and percentages floating all around us. In this same world, we have something known by the name of ‘Profit and Loss’. What is Profit and Loss all about in the world of Mathematics? Well, go back to your childhood and recollect all those trips to the market where you used to work yourself up in a frenzy just to understand what the shopkeeper had done. You used every ounce of your mental strength to calculate prices, check totals and MRPs just to be sure that you were not cheated. That, my friend, was your first introduction with the world of Arithmetic: the world of cost-price, selling-price, mark-ups and discounts. We explore the very same world today, for your benefit. As a starter, let us dig into basic Profit and Loss concepts. We begin with the terminology for this topic. Cost Price: The price (amount) paid to purchase a product or the cost incurred in manufacturing a product is known as the cost price (CP) of that product. 1. Fixed cost: It is a type of cost which is fixed under all conditions and does not vary according to the number of units produced. 2. Variable cost: Variable cost is a type of cost which varies according to the number of units. This is quite easy to understand. 3. Semi-variable cost: As the name suggests, these costs are the ones that are fixed in part and variable in part. Effectively, this is the case that we see most often.Imagine the scenario in a factory. There is a capital cost, which remains the same under all conditions (fixed cost) and a variable cost of the product, which in turn depends upon various factors. Selling Price: The price at which a product is sold is called the selling price (SP) of the product. Marked Price: Do shopkeepers put up price on the label that they wish to sell on or they put up an inflated price? If you think closely, majority of the shopkeepers mark-up their products, in anticipation of the discounts they would have to offer. This is a clever way of operating. Mark-up the price in advance, offer a discount and make the customer feel happy, and then sell the product. Pretty effective, eh? List Price: List price or the tag price is the price that is printed on the tag of the article. For all practical purposes, we assume it to be same as the marked-price. 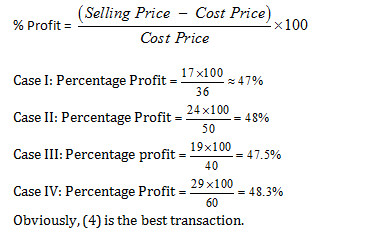 Margin: The profit percentage on selling price is known as MARGIN. Example 1: Pranav sell an article at a discount of 80% and get a profit of 60% on that article calculate the mark up over the cost price? Let us put the above definitions in use. Let us assume that Cost Price = Rs 100. So, Selling Price = Rs 160. Now, after giving a discount of 80% over MP, Rs 160 is the SP. % Mark Up = (700/100) × 100 = 700 %. Focus closely on what is being asked. Remember Profit and Loss is nothing else but an application of Percentages and basic calculation skills. 2. One generates a loss when Selling Price < Cost Price. Example-1: Mehak and Pranav sells some article for Rs 8000 each. Mehak calculates her profit per cent on his CP and Pranav calculates his profit per cent wrongly on SP. What is the difference in their actual profit if both claim to have a profit of 60%? Example-2: Megha and Richa sold two articles at Rs 12,000 each. One is sold at a profit of 20% and another one at a loss of 20%. What is the net loss? So, loss = Rs 1,000. Question 2: In terms of percentage profit, which is the best transaction? Let the original price be Rs. p.
Question 5: By selling a basket for Rs. 19.50, a shopkeeper gains 30%. For how much should he sell it to gain 40%?